Rescue can be rewarding work! These little guys had a rough time, but now have the extra care and love they need. Warning! These stories may bring tears to your eyes. Zackary had the good fortune to be adopted by Leah on December 28, 2018. Leah and family have renamed our Zackary as Zack. Thank You, Leah, for giving our Zackary such a wonderful new home! 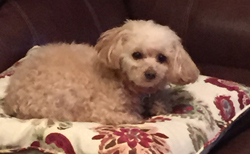 Sassie had the good fortune to be adopted by Lea Ann on April 24, 2015. 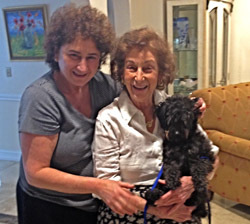 Thank You, Lea Ann, for giving our Sassie such a wonderful new home! 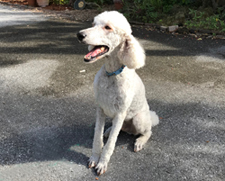 Sassie's Happy New Life: Jerry and I would like to thank our friends at Coastal Poodle Rescue for allowing us the opportunity to provide a loving home for Sassie. 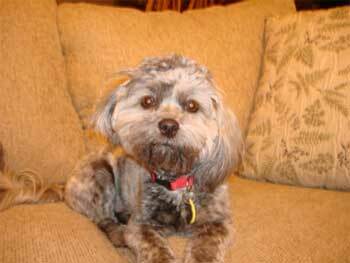 We already had two small dogs a male poodle-mix named Sebastian and a female yorkie-mix named Sabrina. Although we wanted another dog, we were apprehensive because we werent sure how they would get along and also thought it would result in a lot more work. We were wrong. 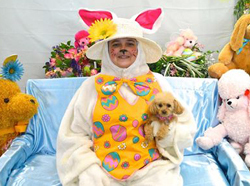 Myla had the good fortune to be adopted by Theresa on March 13, 2015. Thank You, Theresa, for giving our Myla such a wonderful new home! Qiana had the good fortune to be adopted by Olivia on July 11, 2014. Olivia and family have renamed our Qiana as Izzy. Thank You, Olivia, for giving our Qiana such a wonderful new home! 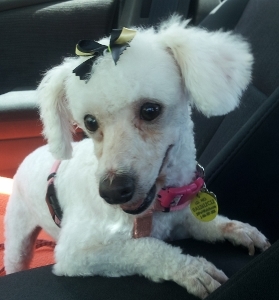 Qiana's Happy New Life: Izzy hit the doggie lottery when she was adopted by Olivia. She is very well loved and quite spoiled. Just look at how happy they are. Cleopatra had the good fortune to be adopted by Louise on July 03, 2014. Louise and family have renamed our Cleopatra as Lily. Thank You, Louise, for giving our Cleopatra such a wonderful new home! Shyla had the good fortune to be adopted by Robert on August 27, 2013. Thank You, Robert, for giving our Shyla such a wonderful new home! 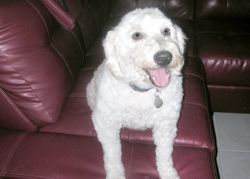 Shyla's Happy New Life: We fostered Shyla in August 2013 and adopted her soon after. She came to us true to her name. Her tail stayed between her legs for months. 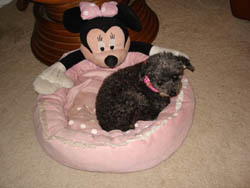 She has now opened up and her tail is wagging She is a a loyal and true companion that has enhanced our life. You can tell from the picture that she is leading a life of leisure on the Indian River. 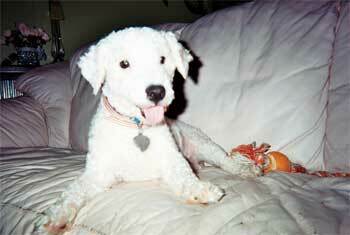 Bronco had the good fortune to be adopted by Ana on April 07, 2013. Ana and family have renamed our Bronco as Pookie. 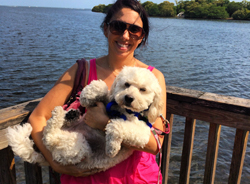 Thank You, Ana, for giving our Bronco such a wonderful new home! 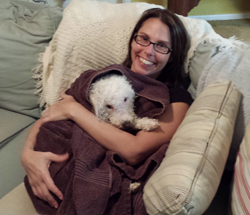 Bronco's Happy New Life: Pookie hit the jackpot in his new home. 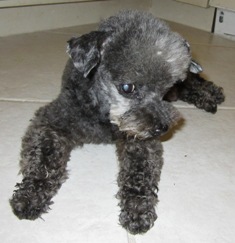 From the streets of Miami, he is now living in the lap of luxury with Ana and her family. Ana is a dentist and Pookie goes to work with her and makes all the patients smile! Sarge had the good fortune to be adopted by Sarah on December 07, 2012. Sarah and family have renamed our Sarge as Murphy. Thank You, Sarah, for giving our Sarge such a wonderful new home! Sarge's Happy New Life: I just wanted to send a quick update on Murphy. I cannot believe it has been a year already since I adopted Murphy! He is such a joy - everyone he meets loves him! 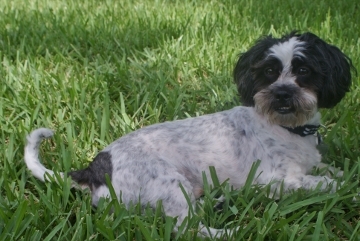 He gets along great with other dogs, loves to play chase, go for car rides, walks, and snuggling! I sent a few pictures of him, the first is of an after bath picture (after his bath I wrap him in a towel like a baby and he sits on my lap until he is fully dry) then a shot of him playing with the covers, a picture before his grooming with his hair long, and after a recent hair cut. He is doing very well! Rambo had the good fortune to be adopted by Lorraine on November 09, 2012. Lorraine and family have renamed our Rambo as George. Thank You, Lorraine, for giving our Rambo such a wonderful new home! 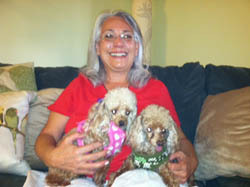 Rambo's Happy New Life: George & Gracie (aka Rambo & Lindi) came home to their loving forever home on Friday, Nov. 2, 2012. I would like to thank Dana, Doris, Marcella, Peg and all the other CPR members for helping me to get these two adorable cuddle bunnies home! George and Gracie did not have any problem adjusting to their forever home with me. They seem to be completely happy and relaxed. I am enjoying them so much and don’t know what my favorite part of having them here with me is, like them, I love our walks and cuddle time as well as watching them wait and gobble up their food at meal time. My new home is now complete with lots of love to both give and receive from my two new babies. We honestly could not be happier! I could not be more grateful for these two new additions to my family –and add them to my gratitude list for Thanksgiving this year. 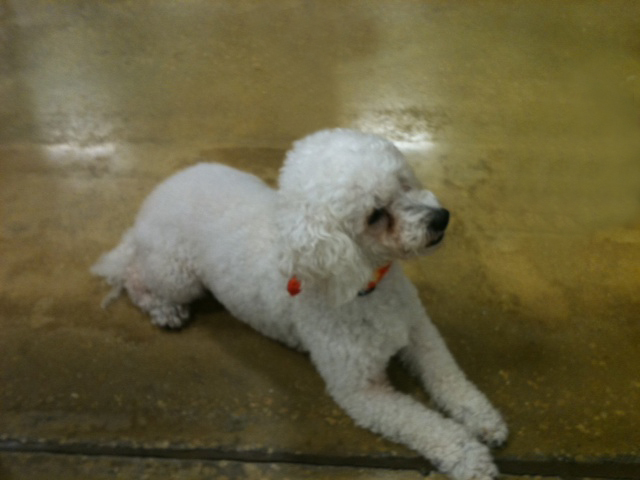 Peeta had the good fortune to be adopted by Patricia on October 19, 2012. Patricia and family have renamed our Peeta as Pete Pierre. Thank You, Patricia, for giving our Peeta such a wonderful new home! Debbie had the good fortune to be adopted by Joyce on October 05, 2012. Thank You, Joyce, for giving our Debbie such a wonderful new home! 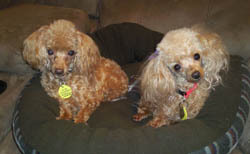 Debbie's Happy New Life: Debbie loves her walks and she and JoJo are like twins...running side-by-side. They look so much alike. One has a long tail and one has no tail, but otherwise very similar. She is just adorable and so much fun. We attract a lot of attention on our walks...they are so adorable. Thank you so much for everything you did for my little girl. She is happy and as healthy as we can keep her for as long as we can. We love her to pieces....she has us wrapped around her tiny paws already. Elise had the good fortune to be adopted by Donna on August 31, 2012. Thank You, Donna, for giving our Elise such a wonderful new home! 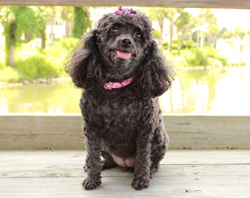 Elise's Happy New Life: Elise was one of 10 dogs CPR rescued from a Sarasota county puppy mill seizure in May 2012. The dogs were all scared and unsocialized, living in horrible conditions and not understanding humans at all. 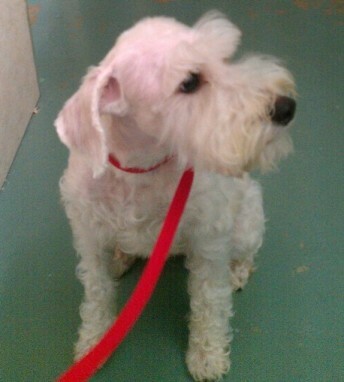 After being rescued, CPR took her into foster care, had her vetted and worked with her on her shyness. She was very skittish of any noises, kids voices next door, etc. We knew she'd need a very special person to adopt her. Donna was the perfect person for Elise and adopted her in August 2012.. She recently wrote to us (March 2013) and said "It's been a long & trying process, but I think we have made a big breakthrough. She is just beginning to come to us. She understands the commands "sit", "outside", "inside", "kitchen", and "you know the rules". 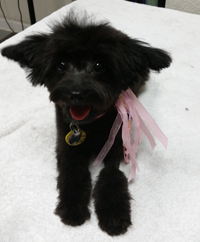 Her favorite thing is to get a bath and get groomed. 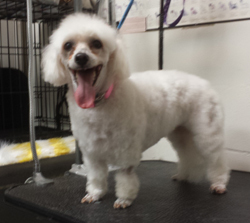 After, she prances around to show the other dogs how pretty she is. She loves the other dogs and she is a real snuggler when we go to bed at night. She smiles and wags her tail when we play music. She's got quite a personality When she gets excited, she stiffens all her legs, puts her tail up high and pops around sideways. We still have a long way to go with her, but we definitely see big improvements. She is a little doll and gets a lot of love". 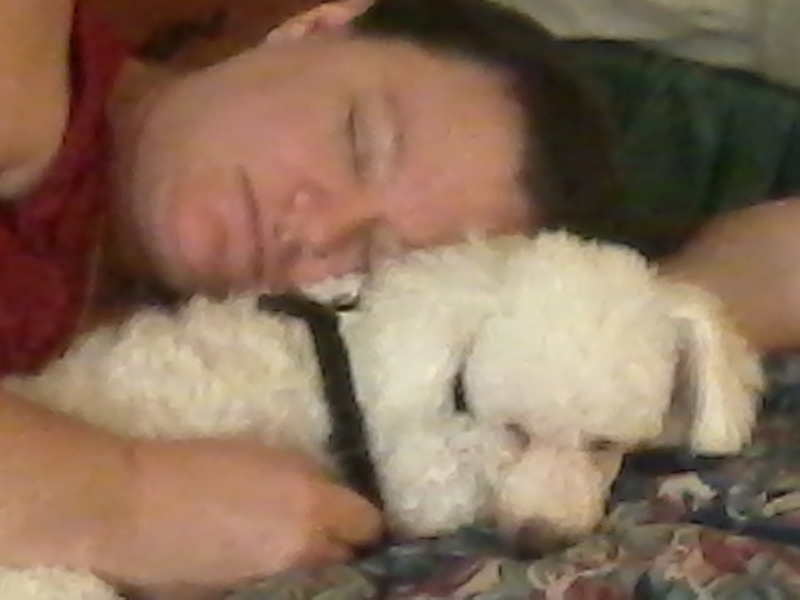 Hutch had the good fortune to be adopted by gloria on August 31, 2012. Thank You, gloria, for giving our Hutch such a wonderful new home! Trip had the good fortune to be adopted by Danielle on August 19, 2012. Danielle and family have renamed our Trip as Giacomo. Thank You, Danielle, for giving our Trip such a wonderful new home! 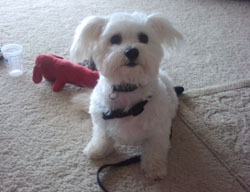 Trip's Happy New Life: I was not a dog lover, and I said I'd never ever get a dog. But, my children so wanted a dog that I finally acquiesced. Your organization was recommended to us, and when I saw Trip (now Giacomo) on your web site I knew he was the dog for our family. I have to say I am in LOVE with this little boy. He is mommy's baby, and my personal protection officer. From the moment he arrived, he has filled our lives with smiles, snuggles and lots of love. He has been with us for five months now, and I can not imagine our family without him. Whenever we take him out (which is all the time because he comes everywhere with us), we get lots of compliments on him, and I highly recommend your organization. The thoroughness of your placement process was stellar. You all do a wonderful job ensuring the dog and the family are a good fit. Thank you for all that you do! 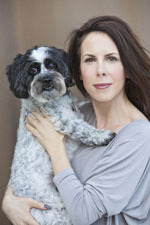 Dillard had the good fortune to be adopted by Carrie on August 10, 2012. Carrie and family have renamed our Dillard as New Dog Name. Thank You, Carrie, for giving our Dillard such a wonderful new home! 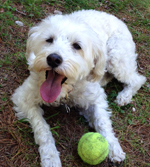 Dillard's Happy New Life: Meet Team Wetzel - Adam, Carrie, Marley and newly adopted 'Dillard'! 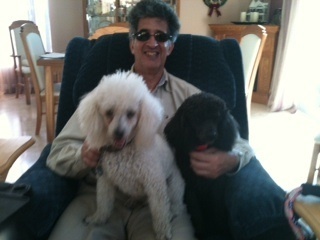 Life has been fun with the addition of their 2nd Coastal Poodle Rescue! Dillard has been with them for one week and they are quickly growing used to his smiling face (never without one of his toy balls in it!) Adam plays in the backyard with him before and after work (I think they both look forward to this time equally!). During the day, sister Marley sits on the back of Carrie's chair with Dillard by her feet. Marley is transitioning from a 1-dog household to sharing affection with Dillard...it is a work in progress but everyday gets a little better!! 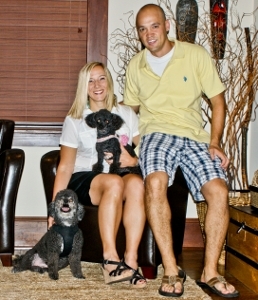 The both love their walks and belly rubs and Team Wetzel is so THANKFUL for Coastal Poodle and the adopted 'kids'! 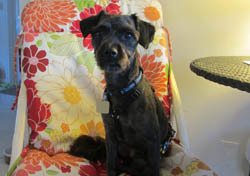 Cisco had the good fortune to be adopted by Jan on March 10, 2012. Jan and family have renamed our Cisco as Nicky. Thank You, Jan, for giving our Cisco such a wonderful new home! Cisco's Happy New Life: Hey! My name's Nicky and I love being adopted. I live with my mom and a foster named Trapper who barks all the time. I also live with Allie, Annie and Baker. All of us get to go to doggie school where we meet our other doggie friends. We have to learn how to be good dogs in public so we do a lot of standing, sitting and walking with our owners and with our doggie friends while we are in doggie school. Sometimes we go on class picnics and they let us take off our leashes and run with the other dogs. We have good dogs at my house, except for Baker who gets in a lot of trouble when he forgets to go outside!! I'm a good boy and so is Trapper, but Baker is very naughty and sometimes we tell on him. 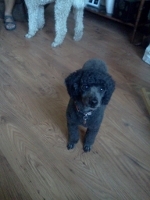 This year we are going to the Annual Poodle Reunion & Picnic. 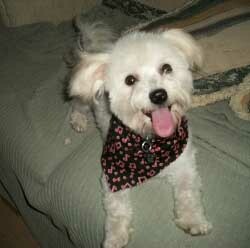 I will get to see a lot of dogs and maybe I'll see my little sister Bella-Charisse there. Well, I hear my mom calling me 'cause it's time to go to bed. I hope I'll be seeing you at the Reunion and if you're there I just might let you see my tennis ball. It's my most favorite toy in the world!! Gotta go now. Bye! Big Boy had the good fortune to be adopted by Jerry on January 25, 2012. Jerry and family have renamed our Big Boy as AJ. Thank You, Jerry, for giving our Big Boy such a wonderful new home! Big Boy's Happy New Life: Big Boy met his brother Tanner in foster care and found a true friend. Happily they were adopted together and have truly found a wonderful forever home! A note from Susan and Jerry recently came to CPR with many photos showing how much joy and happiness they have brought into their lives that they could never have imagined. A wonderful happy ending for everyone: humans and dogs! 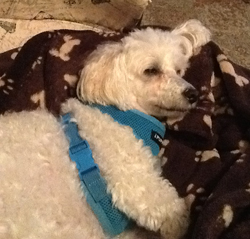 Tanner had the good fortune to be adopted by Jerry on January 25, 2012. Jerry and family have renamed our Tanner as Clancy. Thank You, Jerry, for giving our Tanner such a wonderful new home! 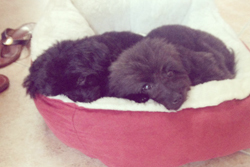 Tanner's Happy New Life: Tanner met his brother Big Boy in foster care and found a true friend. Happily they were adopted together and have truly found a wonderful forever home! A note from Susan and Jerry recently came to CPR with many photos showing how much joy and happiness they have brought into their lives that they could never have imagined. A wonderful happy ending for everyone: humans and dogs! 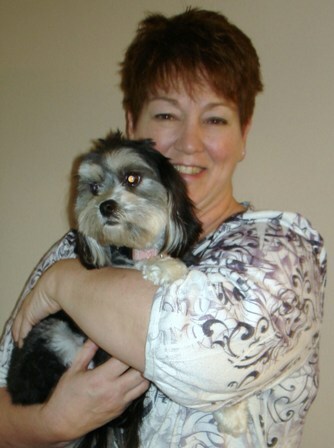 Cherisse had the good fortune to be adopted by Sandra on November 13, 2011. Sandra and family have renamed our Cherisse as Bella Cherisse. Thank You, Sandra, for giving our Cherisse such a wonderful new home! 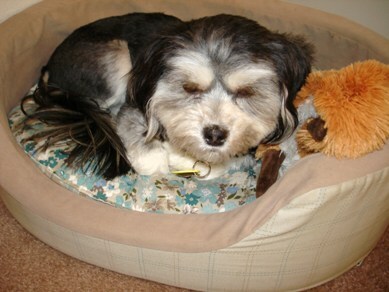 Cherisse's Happy New Life: I just wanted to thank everyone for helping me adopt my new love Bella. She is the most adorable little girl with such an awesome personality. We love going for walks and playing with all her toys. I want to thank Jan for taking such good care of Bella till she found me. I wish everyone would realize how wonderful it is to adopt a furry friend. There are so many of them out there that need good loving homes. 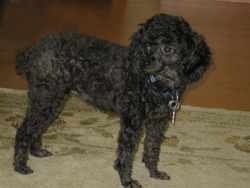 Coastal Poodle Rescue is wonderful. I think the most important thing about adopting a pet is to be honest with yourself what your limitations are and what you are willing to work with. I just love my new furry friend Bella and look forward to many fun days with her. For us the transition period has gone smoothly we have bonded and Miss Bella has learned that if I leave the room I will be coming back. Thanks again to everyone at CPR!! Ada had the good fortune to be adopted by judith on March 26, 2011.
judith and family have renamed our Ada as Keji. Thank You, judith, for giving our Ada such a wonderful new home!